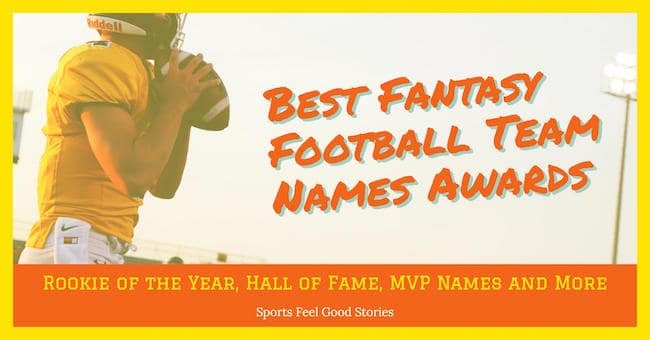 With the NFL Season upon us, it’s that time of year to recognize Fantasy Football Team Names Awards Winners – Best of 2017. 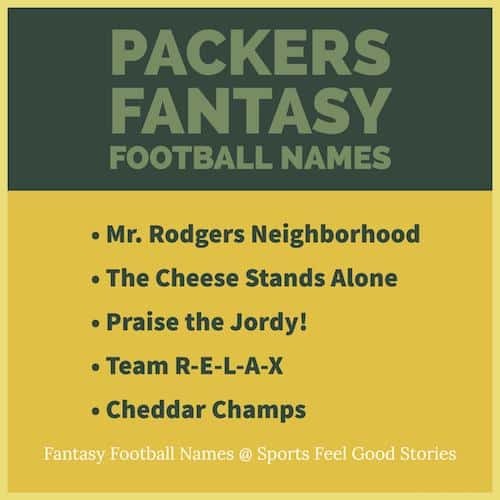 As most everyone knows who plays fantasy, coming up with a great team name is of huge importance. 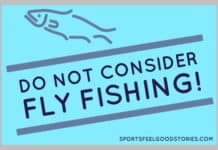 Our ceremony today recognizes that and gives you a few ideas if you’ve yet to name your team. The arduous process of identifying 29 categories, finalists and winners began after last year’s draft. With considerable study and contemplation, our panel of judges debated and determined finalists and winners. Congratulations to all contestants. “Brady Gaga.” Although the judges liked the logo possibilities of showing Brady and Coach Belichick together with the “Brady and the Champ” alternative, the short “Brady Gaga” gets the nod for a million reasons. “Little Red Fournette.” The celebration of Prince’s life continues to be strong as this selection sped by other worthy candidates. Cam You Feel the Love Tonight? “Teenage Newton Ninja Turtles.” A crowded field left the judges with many choices, but with the finishing bites of their pepperoni pizza, they announced “Teenage Newton Ninja Turtles” as the winner. “Going to Brees Right Bayou” wins in a tight race. A little smack talk woven into the team name couldn’t be beat in the eye of these judges. “The Immaculate Collection.” The undertone of this name indicating that the league’s prize money will be coming your way was just too good to pass by. “Highway to Bell.” Le’Veon’s Highway seems to be running down hill for him. The guy just knows how to pick up yards, and may display more patience than any back in history. “Game of Jones.” Game of Thrones reference pairs the best receiver in the NFL with the best show on TV. “Everyday I’m Russelling.” It’s a name with a built in fight song – Everyday I’m Hustlin’. “The Luckness Monster” and “Luck Dynasty” will share this award. Both clever names with great logo possibilities. You can’t go wrong assuming Mr. Luck is healthy enough to play. “Gronky Kong.” So many great choices, but this one cleared all the barrels. “Matty Ice Dragon.” The best thing about GOT is the dragons. This pick was a no-brainer for the fire-spewing judges. “Bye Week.” When in Rome, act as the Romans do. The NFL calls it “Bye Week,” and so should fantasy leagues. 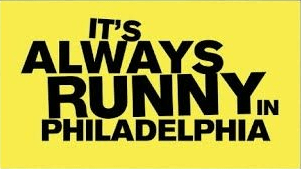 “It’s Always Runny in Philadelphia.” Great show, great name. “Rudolph the Red Zone Reindeer.” It’s the ultimate choice for a touchdown-catching tight end. “Dak to the Future.” The fate of the Cowboys is in Dak Prescott’s hands (or arm or arms and legs). “Miller Time.” Von Miller is the most dominating player on the Broncos. Give him his due. “Men of Steel.” Any link to Superman is a good one. “The Cheese Stand Alone.” What Packers name is worthy of consideration that doesn’t pay tribute to the Dairy State? “To Khalil a Mockingbird.” Ok, Harper Lee might not be proud. “Every Kiss Begins with Clay.” It’s good to see some defenders get some recognition. “Discount Belichick.” Belichick always finds a way to win – this was no exception. “Dunkirk Cousins.” The judges took a what-have-you-done-for-me-lately approach and went with a more recent movie name. “Stairway to Evans.” The Hard Knocks star Mike Evans has moved into the elite receiver category. This could be a huge year for him. “Rudy was Offsides.” A funny take on the football movie classic, “Rudy.” Judges note that this would also make a great league name. “Bed Bath & Beyonce.” Judges couldn’t find one football thing about it, but it still works. “Golden Taint Warriors.” The hottest NBA team didn’t need Kevin Durant to win this recognition. “Eat Drink and D. Murray.” The stars were aligned for this name to come together. “Favre Dollar Footlong.” Do you want to make that a meal? “Sir I Sack Newton.” In the 2015 Super Bowl, Von Miller had 2.5 sacks of Cam Newton including two strip-sacks that turned the game in the Broncos’ favor. 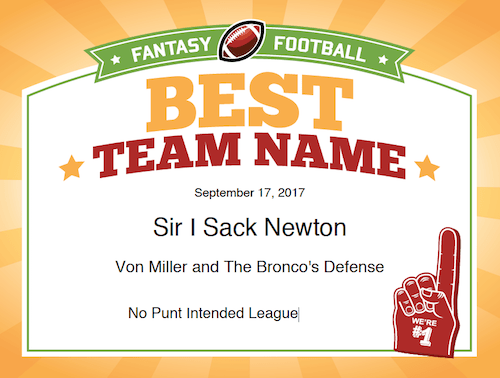 In four short words, your fantasy football name is communicating an awful lot with our 2017 winner. Congratulations all, and we’re out of time. See you next year!